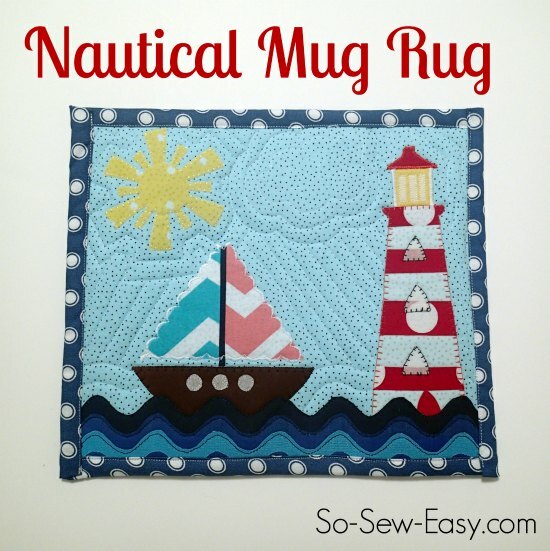 Be bang up to date with this Nautical Mug Rug pattern also known as a place mat. It seems nautical is always in fashion. Want to make one yourself, or one similar? Great! Instructions and the template to download are linked below. Is this your first time with applique ? You’ll probably love the Fun with Fusible Applique class where you can learn more about all the materials and techniques you’ll need. Template included for the boat, waves, sun, cloud and lighthouse. Use the template and instructions to create your own similar to this one, or change it up and make your own design. Basic applique instructions are included, as well as the template. Read more about this project at So Sew Easy . Tagged mug rug, mug rug pattern, nautical mug rug, nautical mug rug pattern. Bookmark the permalink.